I had leftover lasagna today for lunch and it was SOOO much better than it was for dinner the other night (which really, I didn’t think was possible.) But before I begin singing the praises of my (sorta) own lasagna recipe let me give you a little back story about my history with lasagna. 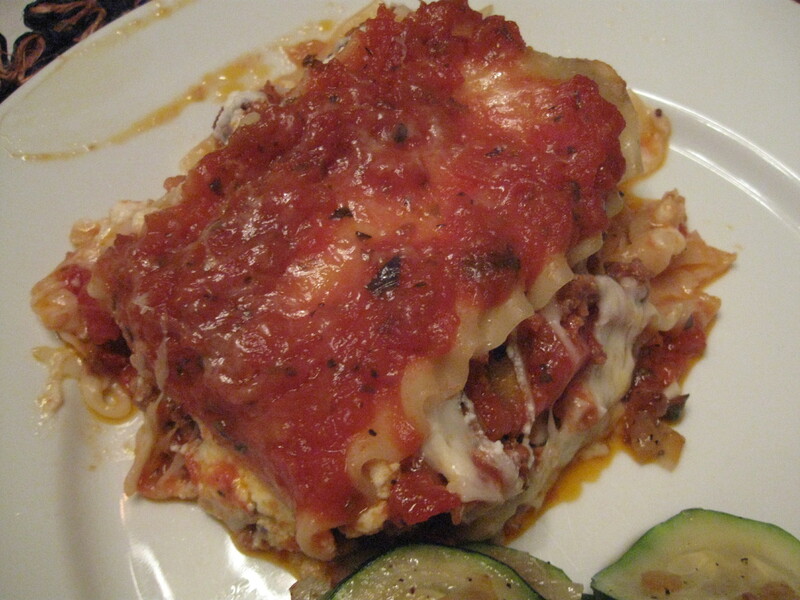 As a kid, the only thing I would order when we went to an Italian restaurant was lasagna. I loved the gooey cheese, soft noodles and mounds of sauce – and my mom never made it at home. I’ve mentioned before that my mom definitely knows her way around the kitchen, but growing up she was strictly the marinara sauce and pasta kind of mom – albeit the homemade sauce kind of mom. 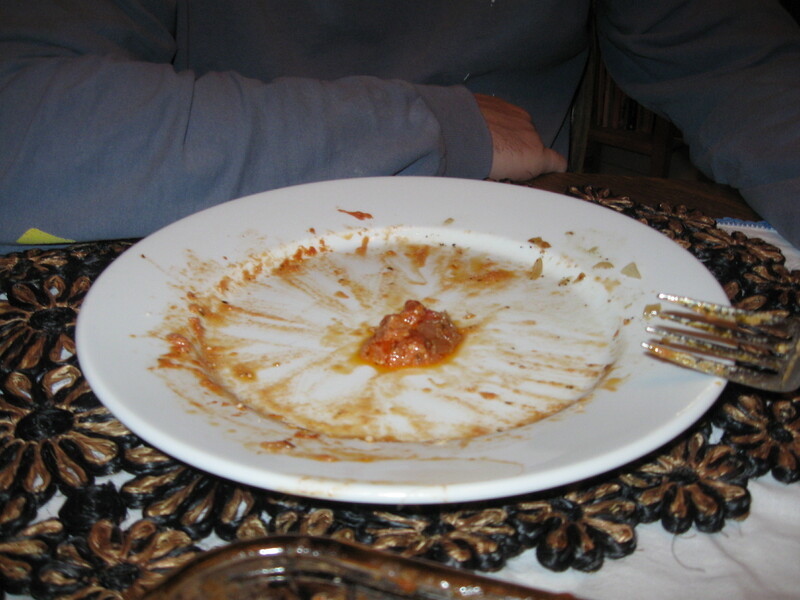 I wasn’t lucky enough to grow up with a portly Italian grandmother who always had a pot of sauce or meatballs simmering on the stove, (I’m asking the Italians now – that’s how it is right? I mean every book I’ve ever read about Italian families makes it sound like that) so I consigned myself to making pasta and sauce forever – albeit the homemade kind of sauce. Flash forward another twelve years and I’m making lasagna last Tuesday night. I usually only make lasagna around Christmastime – mostly because I forget to make it and partly because ricotta isn’t really a staple cheese in my fridge. So why did the lasagna get made so far away from Christmas Eve you ask? I had purchased a HUGE container of ricotta for another recipe the previous week and I’ll be damned if I’ll throw away cheese. Well that was a huge compliment. Because guess what? Kat is a portly Italian grandma. Heat oil in a skillet. Add the onion, carrot and garlic and cook stirring until they are lightly browned. Push to the side of the pan and add the beef, break it up into bits, cooking until it loses its pink color. Puree the tomatoes in a blender or food processor add to the meat and simmer for 15 minutes. Add the butter, oregano, basil, salt and pepper, partially cover and simmer for 30 minutes. Preheat the oven to 375. Assemble the lasagna by drizzling some of the sauce over the bottom of a shallow rectangular baking dish. Put in a layer of noodles, sprinkle with some of the mozzarella, and spread on a layer of ricotta. Make another layer of noodles, sauce, mozzarella and ricotta. Finish with noodles and sauce. Sprinkle Parmesan cheese evenly over the top and bake 20-25 minutes or until hot and bubbling.